Rating: 2 It's an overhyped and very basic affiliate marketing training program. The Bottom Line: While Operation $10K provides you with a decent start to affiliate marketing, you'll soon need to purchase additional programs and/or upsells to make it as an affiliate marketer. There are more in-depth programs out there. Operation 10K, a program created by Desmond Ong & Matthew Neer, promises that you’ll make thousands of dollars each month by employing a simple four step plan. According to Desmond, who Matthew picks up at the airport in his red Ferrari, you don’t need technical or marketing skills to make money with Operation $10K. The only items you need are a computer and Internet connection. I am suspicious of work-at-home programs that showcase flashy cars and easy money; however, the program was priced at only $19, so I decided to try it out. Normally, Operation $10K is supposed to cost $47. On top of that, there was the program’s promised 60-day money-back guarantee. So, what did I find inside? You get a ready-made website with its own traffic and product. This bonus is also discounted, from a whopping $297 to just $49. This upsell is actually a piece of software that you install onto your website. The software creates a pop-up bar that offers discounts to customers viewing your products. This item is priced at $17/month, but Matthew tells you that it will eventually cost $97/month. After I exited from this product, I was finally taken to the Clickbank page where I’d purchased my product. Here, I was able to download and view the Operation $10K product. What did I get with my purchase? In essence, the members’ area features 10 instructional videos. In this video, you listen to Desmond as he pumps you up for affiliate and online marketing success. “Action creates success” and that kind of motivational stuff. Kier Chiu (at least I think that’s how it’s spelled), a marketing manager who works with Chromabit as a project manager, gives you an overview of how Operation $10K works. Kier notes that you’ll be working with buyer leads, not generic email lists. You’ll get these leads by selling cheap products ranging from $5-$10. This low price range will create buyers, which can then be upsold to more expensive products (ahem, much like how Operation $10K works). Kier talks about overdelivering on the products you sell so that your audience feels like it’s getting a good value. You then hear about going to Clickbank to find products to sell as an affiliate. Finally, Kier discusses how you can squeeze as much money as possible from each product sale by promoting products with the highest affiliate commissions. You are instructed on how to select your product niche. Kier says that you should follow your passion when selecting your product. You should also choose a product you have some expertise in. Kier recommends finding a big niche so that you have a large audience to market to, and he also recommends validating your product idea by checking with a marketplace like Clickbank. Product research is the focus of this video. Kier talks about doing competitor analysis to learn what works, and he recommends checking out websites including Clickbank, Udemy and Amazon for successful products. You are told that you can create one of three products as your own personal product: an ebook, a video or a piece of software. Google Docs is introduced as a way to create your ebook, and Camtasia and YouTube are recommended as two tools for making videos. Software creation is not covered, even though software is noted as being the highest value item you can offer to customers. Here, Kier goes into the details of using various online tools for generating your ebook. He suggests structuring your ebook by finding an example ebook on Amazon and essentially copying its structure and rewriting its text. He recommends finding popular subjects to write about by using Google search results to input keywords. 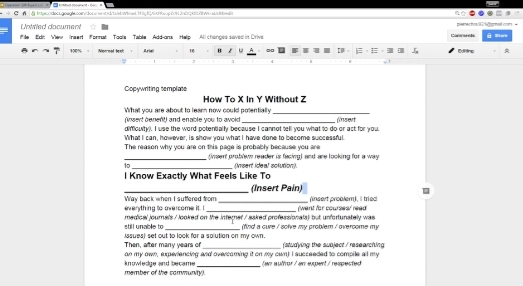 Basically, you’re copying and pasting to create your own ebook. Another topic that’s covered is how to use Google Slides to generate your own video on Camtasia. Interview an expert and create a product based on that person’s expertise. Outsource your product to cheap overseas workers. The sales funnel is introduced and several online tools are recommended for building landing (i.e., sales) pages that convert potential buyers. How do you create a great landing page? Kier recommends just going to your competitors’ pages and copying their design and strategy. An example sales page is built for you in this video, with the example niche being physical fitness. Different platforms are introduced for marketing your product, including Clickbank, Warrior Plus and Cash Network. Here, you are told to find top marketers who can offer your product(s) to their audience. How do you find these top marketers? Kier locates products being sold on Clickbank and searches on their reviews. He notes that most of the reviews are being written by top product affiliates who you can also contact about promoting your own similar products. Desmond presents a method for leeching traffic from a high profile website by posting content to it in the form of a guest blog. First, you check the traffic level that a particular website is getting, and then you check Alexa for its rank (100K or below is ideal). Once you have a good candidate, you write the website’s owner about becoming a guest blogger. Other secret traffic methods are also provided, including the Trojan Horse Traffic Method, the Spike Method, and the Timeline Method. You also get a final bonus called Fast Track Affiliate Marketing Power, which is a Facebook traffic course. This program offers a lot of good introductory material for creating your own affiliate product and selling it through online marketplaces like Clickbank. However, it takes a lot more than a 3-5 minute video to go over some of the more detailed concepts of product creation and marketing. For example, there should have been a series of videos dedicated to the concept of sales page creation. Instead, you receive only one short video and a few templates. 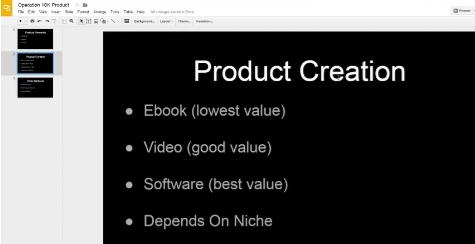 Ebook creation is covered fairly well in one of the videos, but video and software production are glossed over. This is unfortunate because software is even noted as being a more lucrative consumer product. There is also the pointless hype around Operation $10K. Why Matthew and Desmond introduce this product with flashy cars, screen shots of bank accounts, and parties in Las Vegas is beyond me. 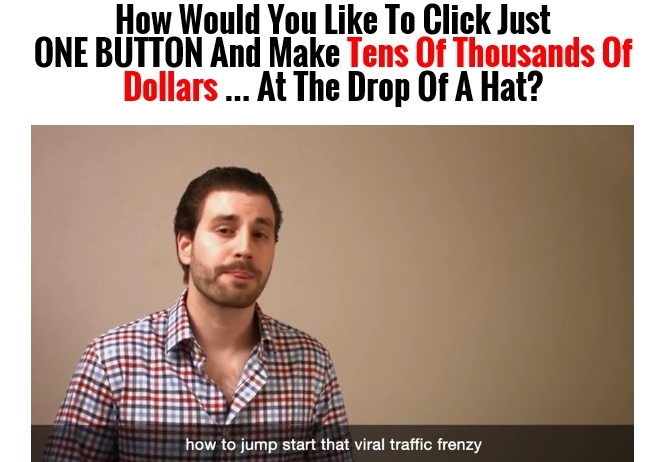 Matthew claims that this system somehow beats other competing affiliate marketing training systems…but I fail to see how. The information presented here is good, but it’s not revolutionary. In the end, you’ll still be doing a lot of work to create and market your affiliate product(s). Finally, while the Operation $10K product costs just $19, its upsells will cost you nearly $388 if you keep this program for a year. Want to learn about an online program that is completely free to try? Then check out my top recommendation here instead. We have zero affiliation with them and do not endorse the program nor do we work with them. You will need to contact the creators of Operation 10K in order to get support.